Dr Lalit Mohan Parashar is a renowned ENT Surgeon practicing in Delhi and the National Capital Region (NCR). 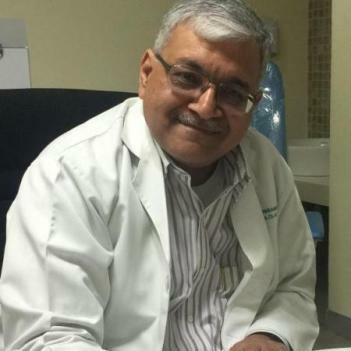 He has an illustrious experience of more than 29 years, and has practiced at some of the best medical institutes of India; like the Indraprastha Apollo Hospital, New Delhi. Dr Parashar, A National Talent Search Scholar, earned his medical degree from the prestigious Maulana Azad Medical College (MAMC), New Delhi, and pursued Masters in Surgery (ENT)from the same institute as well. Dr Parashar holds his expertise in treating and managing diseases of the ear, nose, and throat along with head & neck, and also undertakes surgeries for the same. His specialized areas of treatments include treatment of colds, flu, sinus infection, voice and swallowing disorders, sleep apnea, ear diseases and hearing and balance disorders, and also provides specialized medical and Minimally Invasive surgery for functional disorders of the nose, paranasal sinuses and skull base including sinusitis, nasal polyps, deviated nasal septum, allergies, obstructive sleep apnea, nose bleeds (epistaxis), cerebrospinal fluid leak, benign and malignant tumors affecting the nose and sinuses etc. He also deals similarly with Microsurgery of ear and Head and neck diseases,including curative and rehabilitative surgeries for cancers. Dr Parashar ENT Specialist © Copyright 2016. All Rights Reserved.